TAG Heuer’s innovative and avant-garde spirit is not only found in the originality of its creations but also in the way in which it manufactures and assembles them. Luxury Swiss watchmaking combines manual craftsmanship with the most advanced technology to guarantee quality, precision timing and enduring sophistication. We always carry a wide range including the Carrera, Formula 1 and Link Lady. From the beautiful Carrera range to the Formula 1 collection, the range has something to suit all. 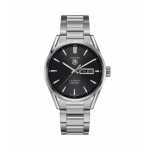 A selection from the Tag Heuer range is available in our Online Shop with a further selection in our store in Crewe. If you cant see the specific Tag Heuer piece please contact us and we will be happy to find it for you.